Those who know the nutritional power of this combination for external applications now have the convenience of capsules for internal use. It is especially useful for maintaining female reproductive health. 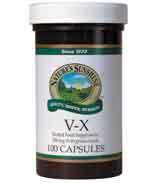 V-X is an excellent aid for women concerned with Reproductive System health. This herbal combination helps cleanse and nourish the system. It contains plantain herb, golden seal root, yellow dock root, marshmallow root, chickweed herb, mullein leaves and slippery elm bark. Take three capsules with a meal twice daily.